FREE UK DELIVERY + £10 OFF YOUR 1ST ORDER. Enter NCD10 at checkout. 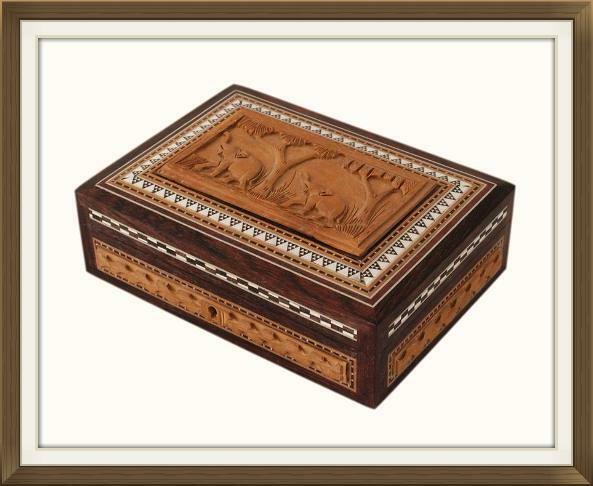 This is a vintage Anglo Indian jewellery box, dating to the 1950s/60s. 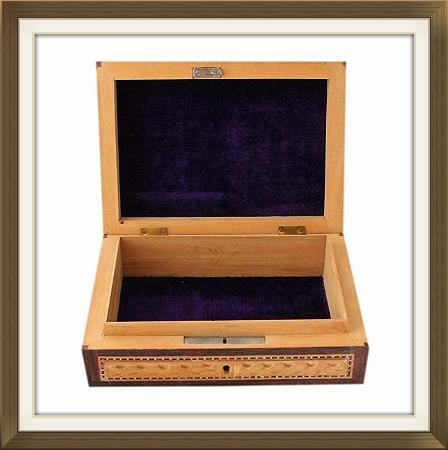 This box is made of Sandalwood and has a beautiful Rosewood veneer. 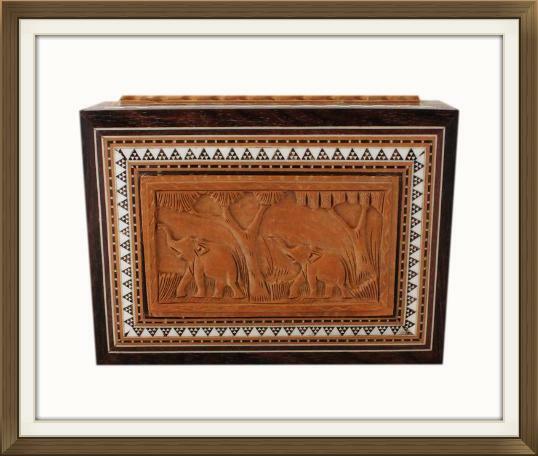 It has a wonderful raised Sandalwood panel to the lid with hand carved Elephants and Trees, plus further raised Sandalwood panels on all four sides. The Elephant's trunks are pointing upwards. This is symbolic of Good Luck. There is a miniature mosaic frame surrounding the panel on the lid plus strips of miniature mosaics on all 4 sides of the box and to the lid. This intricate mosaic decoration is known as 'Sadeli'. Each little piece of the mosaics are painstakingly inlaid by hand. The inlay consists of Rosewood and bone. There is also Sandalwood and bone inlaid stringing, around all of the above decoration. As you can see there is an abundance of high quality workmanship on this box! 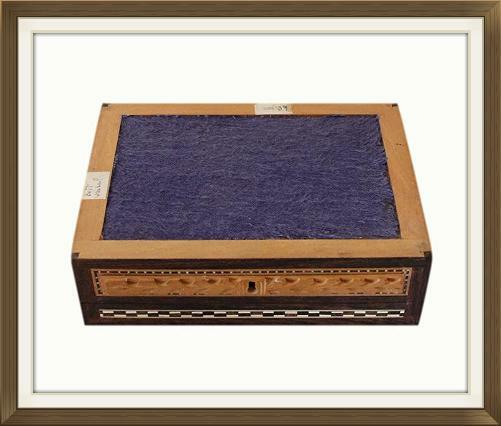 The bottom of the box has its original purple woven fabric covering, and original retaillers labels. 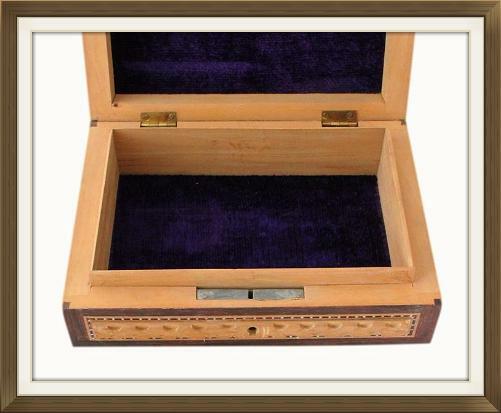 The box has its original stop hinges which prevent the lid from falling back. It also has its original lock. Unfortunately we do not have the key for this box. The interior has a single storage compartment. This as well as the inside of the lid, have their original purple velvet linings. This box is in superb condition with very little wear. It is of sound structure and has no damage. All of the veneer and inlay is present and intact. There is minor fraying to the edges of the covering on the bottom. 14.5 by 9.5cm with a 3.7cm depth.